Anyone who knows me understands my love of Beer – and Boddingtons is the go to. There is nothing better than finding a bar that has it on tap, but the “keg can” is just as good. Boddingtons has been enjoyed by beer drinkers in England for more than 200 years, and is well known for its creamy head and smooth body. Boddingtons is a refreshing, smooth beer renowned for its golden color, full-bodied flavor and malty, moreish taste with smooth, tight creamy head. The cream of Manchester! Boddington’s creamy amber ale is created by millions of tiny bubbles that shoot up from the bottom of the can the second you pop the top! Boddingtons is packaged in cans containing a widget, giving it a creamy draught-style head. 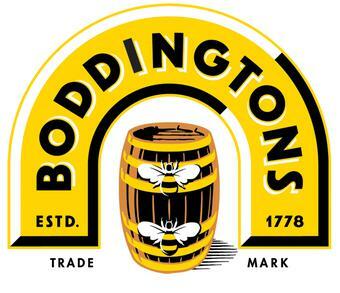 The Boddingtons two bees logo was introduced in 1900. 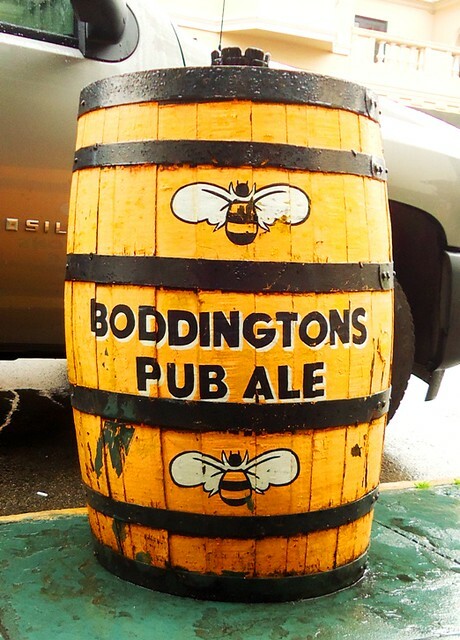 The bees are a symbol of Manchester, from a time when it was a “hive of industry”, but the two bees also represent a pun on the company name of Boddingtons Breweries. Strangeways Brewery was founded in 1778 by two grain merchants, Thomas Caister and Thomas Fry, just north of what is now Manchester city centre. Their principal customers were the cotton workers of Manchester, then a burgeoning mill town. Henry Boddington, born in 1813 in Thame, Oxfordshire, joined the brewery in 1832 as a travelling salesman when the brewery was in the possession of Hole, Potter and Harrison. Like most Manchester breweries at the time, it was a modestly sized operation. Boddington had become a partner by 1848, alongside John and James Harrison, and by this time the company went under the name John Harrison & Co. In January 1853, Boddington borrowed money to become its sole owner. Between Boddington’s takeover until 1877, the brewery’s output increased tenfold from 10,000 to 100,000 barrels a year, making it not only Manchester’s largest brewery but one of the largest in the North of England, with over 100 tied houses. By 1883 Henry Boddington & Co. was a limited liability company. Henry Boddington’s estate was valued at almost £150,000 when he died in 1886. After Henry Boddington’s death, his son, William Slater Boddington became company chairman, and the company went public in 1888 when it was estimated to have assets of £320,465. It was now known as Boddingtons Breweries Ltd. The company owned 212 public houses by 1892, making it the twelfth largest tied estate in the United Kingdom. Its major local competitors were Groves and Whitnall, Threlfalls and the Manchester Brewing Company. After W. Slater Boddington’s death in 1908, the family retained an interest in the company and continued to take a practical hand in its running. Henry’s youngest son, Robert Slater Boddington (1862–1930) had a fifty-year association with the company and oversaw the installation of a bottling hall in the 1920s. Robert’s third and fourth sons Philip (1893–1952) and Charles (1897–1982) served as joint chairman after their father’s death, and Charles took sole responsibility after Philip died.